Think, Believe, and Become part of genuine reform! Great changes can happen if you become involved. New York State cannot sustain it's current direction of wasteful spending and over taxation. It's called THEFT. Find out how you can contribute to the 2010 campaign. Become a Volunteer. The first and foremost reason that I am running for the 46th District Senate seat is to sincerely serve all people within Albany County and New York State in a much greater measure. As a reformer, I not only believe, but know, that I can be a large part of bringing much needed transformation in numerous areas. I will sincerely work hard and persevere until necessary changes are made. I will stand up and speak for what is right and just. I will truly serve the people within Albany County, and all of New York State, with utmost integrity. Since my oldest son Jonathan was killed three years ago, we have been able to successfully get 7 laws passed and signed into New York State law. Although the success I have had in getting laws passed has primarily been in the area of helping the disabled, I have many other important ideas in which I believe that I can tremendously help the people in New York State. I have worked many hours with numerous legislators and the legislative leaders in both houses over the past three years, and I have established a good rapport with many of them. To serve all people in Albany County and New York State with integrity. To work extremely hard to restore hope to New Yorkers and help them become more activated in the process of reforming state government. My personal experiences proves that with the right goals, perseverance and the knowledge of what to do - great changes can happen. I will work to prevent tax increases and minimize government waste. I will work hard to uncover corruption and genuinely bring about much more transparency in all areas of state government. I will work hard with professionals in the business sector to find numerous ways to increase jobs, through wise incentives. I will have a open door policy and my staff and I will be very accessible to the general public. I will work hard in a bi-partisan way on as many areas as possible for the good of the people-I will be the best public servant possible. I will fight for what is right and just in all areas. Over three years of experience creating new laws to protect disabled children and adults as a parent advocate. 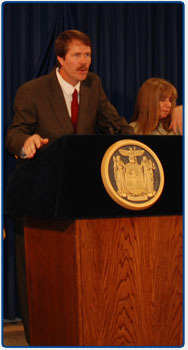 To date seven laws have been signed into New York State law due to hard work and perseverance following the tragic death of my oldest son Jonathan who was disabled. I have worked many hours with numerous legislators and the legislative leaders in both houses over the past three years, and I have established a good rapport with many of them. (2007 to present). Started the Jonathan Carey Foundation in 2007. The mission of the Jonathan Carey Foundation is to help vulnerable children, disabled, orphaned, abandoned, and abused, and to work with and support existing organizations which currently care for children in need. The Jonathan Carey Foundation is a 501C3 federally approved tax exempt charitable organization (2007 to present). Worked on a volunteer basis for approximately 14 years with Hearts of the Father Outreach, seeking funding for orphaned abandoned and abused children, until present. Went on several mission trips to Africa, to further serve children; and have spoken publicly several times to large gatherings. Served on the advisory board of HOF for approximately 8 years: Currently serving on the Board of Directors beginning in 2009. Owned and operated Solo Auto Sales since 2002. Closed business for approximately 1 ½ years following son Jonathan’s death on February 15, 2007. Have run the business on a part time basis due to my legislative work, as well as work with our Foundation. (2002 to present).